First, thanks so much for your comments about the podcast, they are extremely helpful. Keep them coming, I’ll summarize what has come in at the end of next week (seems like one votes for one host or two hosts votes are about 50/50, same with whether the show could charge a fee or not….) I’ll keep you posted. Here’s some more information from the IFAAB meetings in Tucson. There were two very interesting talks about breed recognition and breed-based behavior predictions. Victoria Voith, one of the first board certified veterinary behaviorists in the country, enrolled us in a study she is doing on breed identification. Given that breed bans are based on, well, breed identification, she and others are gathering breed identifications from a total of 1,000 people. We all took the survey, being shown about 25 or so photos of dogs, and were asked to identify the dog as a purebred or a mix. If we thought it was a mix, we were asked to identify the primary and (if relevant) secondary breeds contributing to the dog. After we all took the ‘test,’ Dr. Voith told us the results of DNA testing from the MARS breed identification tests (more on that later). First of all, we were all relieved when we were done… our brains were starting to fry. (We had a limited amount of time to make our guesses and it was hard work!) I was glad when we were done, not just because it was getting tiring (and I don’t think I have ever been very good at breed ID! ), but also because the results confirmed my world view.. always reinforcing when that happens, isn’t it? Most of the dogs shown came up as mixes of mixes: 25% this, 12.5 % that.Very few came out as 50% of one breed and 50% of another. All this is good ammunition against breed bans… who can be sure a dog is a “pit bull” anyway? This study has the potential of providing good science that can be used to fight breed bans, which I am adamantly against. Another study was presented by Dr. Amy Marder, another Board Certified Veterinary Behaviorist. She is now the Director of the Center for Shelter Dogs in Boston, a great use of her knowledge and experience. They sent in DNA samples, also to the MARS Wisdom panel, of dogs identified as “pit bulls.” Sure enough, they came back with some Am Staff yes, but also plenty of Viszla, Gordon Setter, Irish Setter, etc etc etc. In some of the truly ‘bully’ looking dogs, Am Staff wasn’t even present, or was present only as a ‘trace’ amount. She also showed a slide of a fuzzy, fluff ball spaniel-y looking thing, who turned out to have a signficiant amount of Am Staff… who would have guessed it? (Not me, neither did any of my colleagues). Granted, we all agreed that DNA testing of dog breeds is a work in progress. Is it 100% accurate? No, it truly isn’t, it is relatively new, and it is so complicated (after all, look at all the breeds that are less than 150 years old that were created from other breeds…), but it still can be interesting. Have any of you tried it? I’m tempted to send in some samples of mixes I know the parentage of, just to see what comes up…. Lastly, Dr. Marder discussed a study (I’ll find out where it was published, think it was in 2007) in which they did behavior evaluations on 61 shelter dogs, 21 of whom had been identified as ‘pit bulls.’ The ‘pit bull’ types showed no more aggression over food or handling than the ‘non-pit’ dogs, although the bully type dogs did test out as being more easily aroused. In my experience with bully breeds, (which is significant but not extensive), the arousal issue is an important one. A low threshold for arousal and difficulty de-arousing is perhaps the biggest (and only?) difference I’ve seen in bully breeds. Meanwhile, it’s going to be 50 degrees tomorrow, which means lots of mud but a tempting appetizer of spring. The sheep get shorn Sunday morning, can’t wait to see how they look out from under their wool coats. I have recently acquired (is that the right word?) a new dog, and she has four completely different pure bred grandparents. Absolutely fascinating, because they all show up in her behaviour, and she can actually look like each of them too! (Photos to illustrate that here and here). Hope you enjoyed a peace-and-quiet weekend! oh breed ID and bsl — What a disaster! No one knows what a “pit bull” really is.. even the purebred versions (APBT/AST) are so generic that people can easily mistake a variety of breeds/mixes. Who thinks this dog is the slightest bit pit-bullish? not me! I think the science of DNA/breed testing has a long way to go. All the more reason why, as you say, dogs should be judged as individuals. What a fascinating study! I recall seeing a “find the pit bull” page and noted that a lot of people couldn’t figure out which one it was. I detest breed bans. They’re just ridiculous and generally do nothing but punish decent folks and decent dogs. DNA testing in terms of identifying what breeds a mix is comprised of (or even identifying an obviously purebred dog as it’s own breed) is always going to be horribly horribly inaccurate until databases of thousands and thousands of dogs of each specific breed can be amassed to do the massive sequence crunching to identify the regions of DNA that are correlated to a particular breed phenotype. We identify our breeds primarily by their behavioral traits and outward appearance — both things that can be controlled either by a gene, or a repeat of a random stretch of DNA between genes, or higher expression of a protein entirely unrelated to the final phenotype that modifies some other thing that makes your dog’s nose long rather than short… etc. This makes genetically correlating a phenotype to a genotype incredibly difficult. Researchers have been trying to do this to predict outcomes of human cancers for years (first with DNA and then protein expression studies) and this is a hard hard problem with lots of pitfalls and technical difficulties. On the other hand, because purebred dogs are pretty genetically similar (unlike humans) with a large enough sample size it should be possible to eventually put together that database, and then judge the components of mixed-breed dogs… but do we want to be able to do that? Right now, even purebred AmStaffs can get their DNA tested, come back as a non-dangerous breed, and save their owners a boatload on insurance. That would go away. On the other hand, by expanding the database, we can do an incredible amount of study into the basis of diseases that seem to be more prevalent in some breeds than others, and work to breed them out, or come up with viable treatment options. There are studies going on now with phobias and OCD in border collies that may even eventually impact the way we treat those psychological ailments in humans. I had the Canine Heritage test done on my dogs back in 2007. This one is done with a cheek swab and at the time, they had a limited pool of breeds that they could identify. My two dogs are both rescues, so we have no idea what breed(s) their parents may have been. I think it’s fun to guess, but I don’t take it too seriously. I’ve considered the blood test that my vet can have done but haven’t been willing to commit the $$$ towards it yet. I haven’t tried the DNA testing, and I probably won’t. I know quite a bit about DNA and genotyping, and even with this base of knowledge, I haven’t come up with a compelling reason to have my mix breed dog tested. Knock on wood, she is healthy and unless she becomes ill with something that a DNA test could help diagnose, I will just let that part of her remain a mystery. Judging from her behavior, I think she has a good dose of hound in her, and sometimes she gets a look with that “set jaw” that beagles tend to have. Besides it is a lot of fun discussing what kind of dog I have on any given day :). Several of my friends with mixes (aka All-Americans) feel the same way. As for the “variety in dogs”, I learned that at an early age. My first puppy, Spooky, had a purebred collie for a mom, and an “interloper” for a dad. The only thing remotely collie about Spooky was that her nose was long and narrowish and she had a long tail. Otherwise she was black with bits of white on her chest and tips of her paws and had a very wiry coat (and a reddish! beard). I hope you all enjoyed the “warm” weather. PS, about the sheep being shorn, will they be warm enough without their coat to deal with a few more cold snaps? I know I keep my winter parka handy until June! i have done a canine heritage test on one of my dogs,stella. her mother was a stray 30lb black lab mix who was pregnant when we got her. she had 8 puupies 6 yellow 2 black. one yellow female with all the rest males. i have mother ,stella, her daughter, and stanley, one of her sons, both yellow. thought they were lab beagle, then as they started to grow i noticed some herding qualities, running the fence, that collie stare down,etc. i did the test on stella and it came back as secondary,cocker spaniel,they do have big soft ears, and in the mix, lab, yup they swim and retrieve , collie and shetland sheepdog, yes look out anything in distance they will try to herd you up. it was fun to do and helpful to know since i can look into these breed qualities to help me understand my dogs. I’m new to your blogs, but not your books. 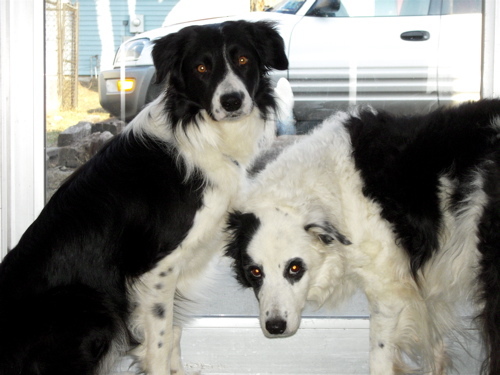 I have border collies too and make my living training people to train their dogs to herd sheep. I work with all breeds, but I’ll admit, I’m a border collie snob! We start lambing in about 10 days so I’m getting ready to be sleep-deprived. But I love lambing – it’s like Christmas every day. And watching baby lambs play is one of the best therapies I know of. I have a question about a young dog I have. He’s 17 weeks old and I bred him. I sold his brothers and sisters and was sort of left with him because he’s hard to place. I’m not sure if you’d call him shy or reserved. He’s affectionate towards me, plays with all the other dogs, plays with the cats. He’s not afraid of new noises or most new situations, but he doesn’t like approaching people or being approached by people, including my husband (who he’s seen everyday for 17 weeks). I just got your booklet on the cautious dog and I’ve been trying to start on throwing treats. Right now I put him on a long line and give him a little slack then ask people to approach him by crouching and turning sideways. I’m also taking him to a puppy class at petsmart for socialization (luckily the instructor is up on all the new techniques including clickers, etc). The puppy hasn’t shown any indication that he’d bite – he avoids contact and goes into his crate if approached. Am I on the right track with him (his name is Luke, btw)? Thanks for reading this and I look forward to more of your blogs – especially about Will and your lambs. Dr. Marder spoke on the same subject at a conference I attended in February. Very interesting, the DNA samples showing we don’t know what is really a pit bull. I had already sent letters to the legislature here and spoke here against a breed ban. Thankfully we defeated that ban but I wish I had known all the things I learned at that conference before having to go up against the law-makers. I hope you don’t mind – this is totally off subject and I am just learning to navigate your site. I just read your article in the Bark magazine just out. Thank you for sharing your stories of the changes in Lassie. Having recently lost my (not dna tested) all- american, Solo at 15 years old, I can relate to how our expectations of them change. Solo may have slipped on her training responses, but she always did the best she could. Rides alone with me continued to be as special to her as when she was an active therapy – although they only lasted about 15 minutes near the end. As Lassie does, she enjoyed her cuddles on the couch, getting treats for the other dogs doing their tricks and greeting me each day as if it was the best of her life. Thanks for letting people know it not only Ok to spoil your dogs in their later years – it is earned and deserved. As far as DNA testing goes I’m not so sure if it’s all that accurate. A friend of mine, who knew the parents of his mutt, had it done and the result didn’t even come close. Real strange……… or they mixed up the tests. Who knows. Fascinating discussion of the DNA testing. One of my dogs is a rough collie. I know his breeding and he comes from a long line of rough collies. that said I’m tempted to test him because I wonder if it would come back with some of the bits and pieces that were used to make up and then to revitalize the collie breed. Hard to think anything is truly “pure”. I loved the discussion of the seek the toy game. Thanks for the reminder. I have a dog whose limited vision is now virtually gone and what a good reminder that this is something I should be spending some time on now so she can enjoy using her mind and nose solving puzzles in the home environment she can negotiate safely. Query–an idea like this is something I’d love to share with my obedience students–how do you feel about having a paragraph or two printed to hand out in a class with proper attribution of course? Thank you for this blog and all the great comments. This is exactly the kind of information that needs to get out there to the general public!! Also, on a side note, it is important to keep in mind that many, many ‘pit bulls’ (here I would like to say the majority, but that isn’t something that I can back up with anything other than anecdotal evidence) live out their lives as healthy, happy family pets like any other dog. Historically, too, many, many dogs that we call ‘pit bulls’ were simply companions and/or farm dogs. Though these dogs don’t seem to make the news, nor are their genes given much consideration. I tested both my dogs using the Canine Heritage test. Dasher came back Border Collie (no surprise)Collie and Sheltie. Dasher is black and smooth coated with a face like a deer and tipped ears – a little larger than most BCs I’ve seen (though I understand the vary widely) I’ve often been asked if she’s a McNab. 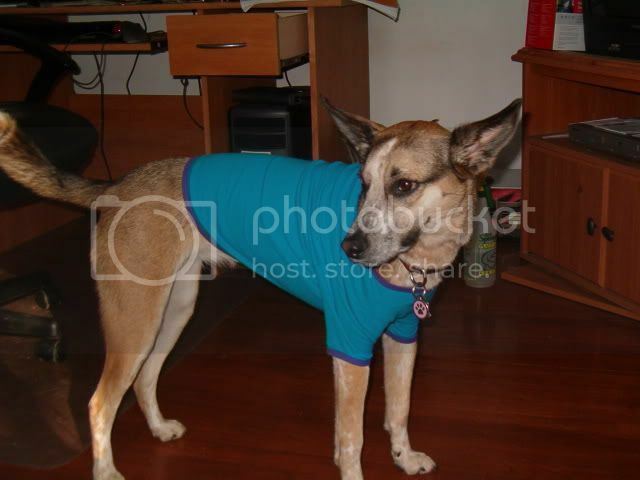 Looking at Bella, I guessed she was a pitbull GSD mix, but she came back as Doberman Shi-Tzu, Dachsund! When I happened to be going through a breed book, I saw a Pinscer (Not Doberman) and her body type was right on. She does have the little spots above her eyes, but her coloring is that of a GSD. Canine Heritage said they would retest because they did not think the breeds were her predominant ones. They lost the second result last summer and I haven’t bothered to send in a new one. I did it because of curiosity and I’d like to get a bumper sticker made to compete with all the Purebreds out there. Mutts don’t get too many calendars, mugs, etc.